5 day combo (trekking & kayaking) tour through the Namha National Park - Trekking in Luang Namtha, Laos - Hiking, Kayaking, Cycling, Village Tours - Discovering Laos! 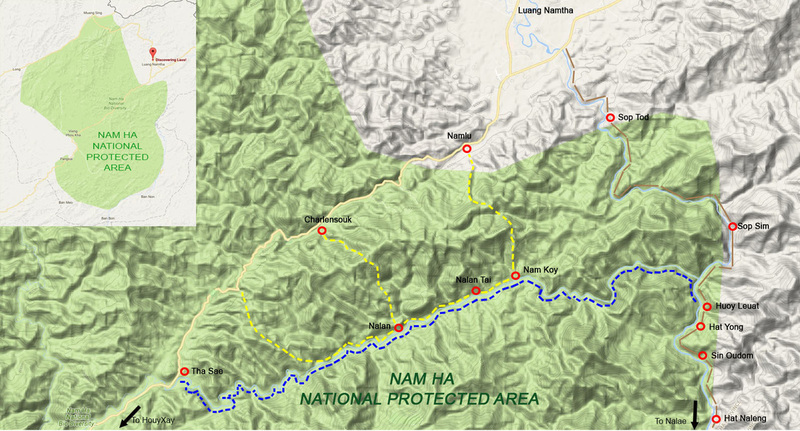 Over 5 thrilling days travel far and wide in the wild world of Namha NPA. 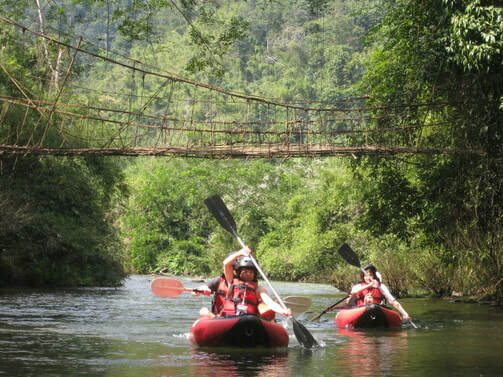 Kayak along two major rivers of Namha: the fast-flowing and dramatic Namha, and the wide and mighty Namtha; trek further to explore the hidden heart of the forest. ​Discover the enchanting natural world hidden deep within the primary rainforests of Namha NPA. Feast your eyes upon captivating views across the hills and valleys of Namha NPA – cameras at the ready! Learn jungle survival skills: how to forage for food, build shelters, utilize natural resources. Have the unique experience of camping in the depths of a wild and mystical jungle. 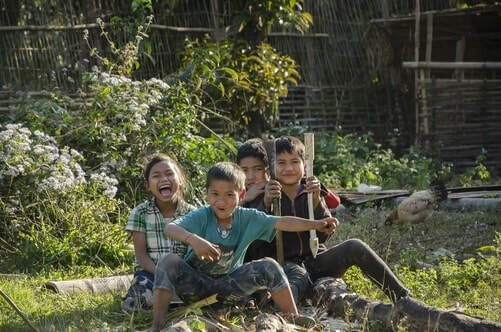 Visit remote hilltribe communities and discover their rich culture and way of life. We met at the Discovering Laos office at 8:00am and take a tuk-tuk to Tha Sae village on the Namha river. On the way we stop off at the local Lao market for supplies. After some basic instructions on kayaking techniques and safety we begin paddling downriver through the heart of the national protected area where, almost immediately, we find ourselves surrounded by lush tropical forest rising high from the riverbank on either side. After a few hours paddling through spectacular scenery and thrilling rapids, we stop at a peaceful riverside location for a Lao picnic lunch and, as is highly recommended, a refreshing swim in the river. Back on the river we encounter a series of yet more exciting rapids, all set against the backdrop of stunning natural beauty. Further downriver we stop off to visit a couple of minority villages; heading first to the Khmu village of Ban Nalan, followed by the Lantan village, Ban Nam Koy before the river carries us back into the wilderness. The current alternates between periods of calm and fast flowing waters, with the chance to spot beautiful tropical birds between tackling wild rapids. Towards the end of the day we join the mighty Namtha river and, after crossing a final few rapids, we reach Houy Leuat village. After meeting the villagers and the family hosting our homestay for the night (or the new ecolodge may be ready) take time to explore the village or relax. At 7:00pm we will share a delicious Lao dinner with our hosts, after which head to bed for an early night or share a drink and socialist with the locals. Wake up to the tranquil sounds of village life and a hearty Lao breakfast. At around 10:00am we cross the Namtha river and follow a trail leading up steep hillside into lush tropical forest. After hiking through the morning we find a suitably picturesque location and stop for a Lao picnic lunch. Continuing on the trail we soon find ourselves deep in an ancient forest, surrounded by giant trees as the sounds of wildlife in the air. As we move further into the afternoon we must find a suitable campsite for the night. 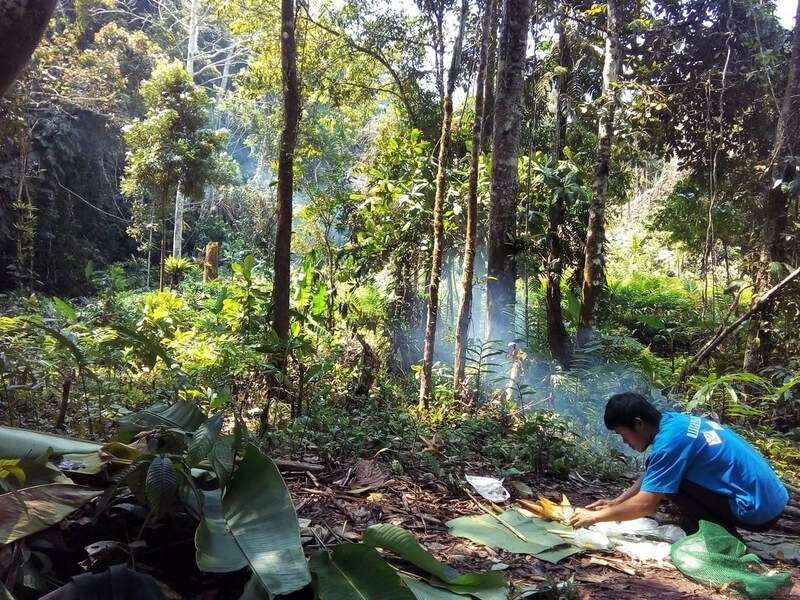 Learn how to set up a banana leaf shelter and bamboo cutlery from our guides and later enjoy a well-earned dinner, freshly prepared over the campfire. As night falls enjoy a drink and conversation around the campfire before falling asleep to the sounds to the enchanting sounds of the jungle. Wake up to the sounds of the jungle again and a tasty breakfast prepared by our brilliant guides. By 10:00am we will continue on the trail as it courses through the wild jungle, crossing hills and valleys shaded from the sun by the canopies of giant old-growth trees. As lunchtime approaches our guides begin collecting resources from the forest to use in preparing a traditional Lao lunch - jungle style! Back on the trail we pass through wild primary forest and steadily descend into a lush valley, crossing streams and ravines by stepping stones and fallen trees. Soon after, we reach the jungle camp, a purpose made campsite in the heart of the jungle. After preparing our sleeping area we build a campfire ready for a delicious dinner. Spend some time around the campfire and later fall asleep to enchanting sounds of the forest. ​Waking up once more with the natural cycle of the jungle, we enjoy a tasty breakfast with a warm drink. 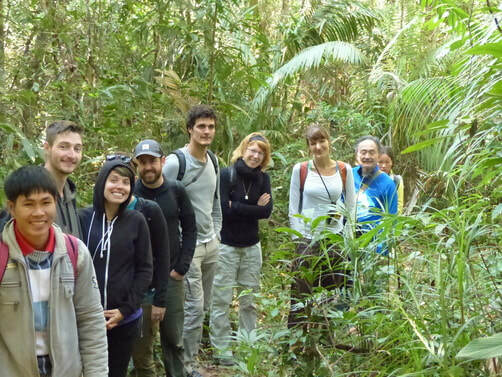 At around 10:00am we will continue back on the trail through lush forest, crossing rugged terrain. 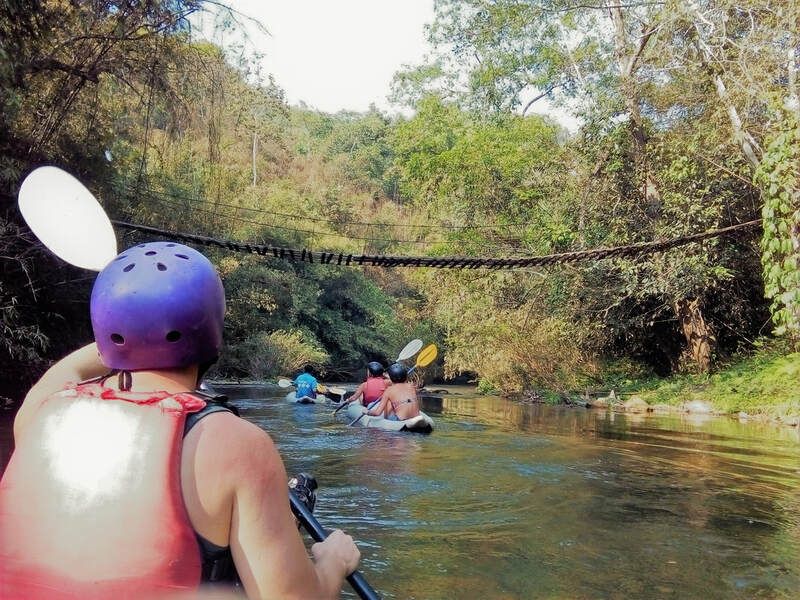 Around midday we will stop at a picturesque location for Lao jungle picnic, before pushing on through the wild jungle landscape; crossing streams by fallen trees or stepping stones, and climbing over or under mighty trees fallen across the trail. Pushing on through the jungle we soon reach the eco-lodge by the Namha river. Across the river lies Nalan Tai village of the Khmu people. We have a choice of where to spend the night: either at a homestay in Nalan Tai village, or at the eco-lodge across the river. Before dinner is served at 7:00pm enjoy a rest or take a refreshing dip in the river. After dinner our guides will build a campfire for your enjoyment. When ready head to bed in the comfort of the eco-lodge or as a guest of a village family at their homestay. ​After waking up to the unique sounds of Khmu village life, a tasty breakfast and warm drink will be served up. After breakfast we set off on a trail that follows the course of the serene Namha river, flanked on either side by steep, forested hills, with stunning views of rice paddies along the river valley. At midday we stop by a picturesque location near the river for a well-earned lunch break. After which, we follow the trail as it heads away from the river and deep into the jungle. We push on over steep, densely forested hills and across lush, verdant valleys sheltered from the sun beneath the canopies of tall and mighty trees. Eventually, he forest gives way to cultivated jungle and, before long, we reach the village of Doi Luk Kham and the end of our trekking adventure. A tuk-tuk will be waiting to transport us back to the Discovering Laos office, arriving back in Luang Namtha at approximately 4:00pm. The price ranges from $162/person (USD) for 8+ Pax to $503/person (USD) for 1 Pax.